I have been wanting to make these cabled mitts from Crochet Today ever since Erin posted about them a few months ago. And once I got past a few days of being completely disinterested in crafts at all last week, I started on these. I was a bit nervous, just because these included a few crochet skills that I haven’t ever used (the cabling, and crocheting only in the back loops) but everything seemed to be going okay at first. But as I was working on them last night, I had to admit that something had gone wrong somewhere, and I’m still not sure what it was. It’s especially frustrating, because as far as I can tell, the cables (the part I was most worried about) seem fine. This is supposed to be the left, but it’s clearly the right, and there’s no way it’s big enough (I stopped with only a few rows to go in the pattern) to wrap around my wrist. 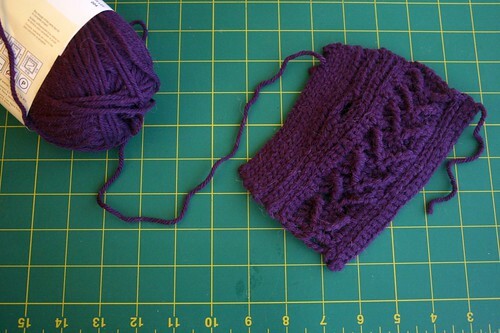 I figure I’ll have to start these from the beginning, either with different yarn or a bigger hook. Sigh.